News from the Sensei : Questions about Aikido. Aikido is the practice and training in a secret principle called "Aiki". Aiki is a secret concept known only to certain ancient Japanese clan Samurai warriors. This concept, application, or principle was used in their fighting strategies when they engaged their opponents. As the clan style of civilization began to disappear and as the ways of waging war began to change, the concept of "Aiki" became even more secretive and was passed on only from one Headmaster to another within the groups that still possessed this knowledge. 2. How was this knowledge or concept passed on to us in this modern time? When the time of the Japanese clan warriors had completely passed in the late 19th century, one of the last great warriors, Sokaku Takeda, was wandering around Japan, earning a living teaching secret Samurai techniques to people. He would charge them by the technique and he would travel in a circuit which grew larger and larger as he met more people that wanted to learn. Coming from a Samurai family and background, he was qualified to do nothing else. He knew nothing else except the ancient fighting techniques of the Aizu clan. He would enter a city, draw some attention by defeating local ruffians and thugs and then gather a small group of trainees for a meeting. He would teach them a few techniques and then tell them to practice these until he could return later in the year, then he would move on. On one of these circuit journeys, he met a young man named Morihei Ueshiba. This young man was an exceptional student who paid to learn more and was good at what he was taught. Morihei was especially dedicated and he gained the approval of Sokaku Takeda to the point that Morihei was able to learn the secret of Aiki from Takeda over a 21-year period of training with him at certain times of the year. This secret of Aiki was an aspect Takeda didn't teach the average person. It was not to his advantage to do so as he kept his clients coming back for more and he also kept his mastery over them by hiding the secret. With his knowledge and ability, Morihei developed a reputation in Japan as Japan's greatest martial artist. 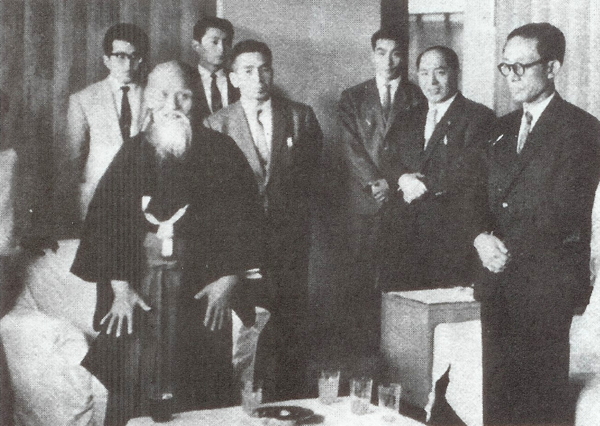 What helped him develop what is now called Aikido was when he met a religious leader who changed Morihei's worldview. The man was named Onisaburo Deguichi. Deguichi was an eccentric and odd man and had many far-fetched ideas, but his ideal of peace on earth was one of the main issues that deeply influenced the young Morihei. Morihei Ueshiba then began to develop the idea of a superior martial art that would teach the ideal of non-fighting or the ideal of stopping an attack with "Aiki" with the view of peace in mind. This revelation came to him in an incident where he got into an argument with a sword fighter who grabbed a wooden practice sword and started attacking Morihei. Morihei used evasive movements until the sword fighter gave up the fight exhausted. It was then that the revelation of taking away the spirit of opposition and fighting from your attacker came to Morihei. Morihei spent the rest of his life perfecting "Aikido", the art of peace. This would be an art that he hoped people would use the length of their lives to learn, in which they would learn the principles of non confrontation, peace with all and victory over our own aggressive fighting tendencies. Morihei believed that this secret concept of "Aiki" was what would give the exponents of Aikido the ability to defeat almost any opponent and that the art would be effective against a real attack and yet teach peace and good will toward all at the same time. His main concern though was always that this art not be taught to criminals or evil people who would use it for bad purposes. 3. Is "Aiki" easy to learn? No, it's actually quite difficult. Everyone can learn Aikido but you must exercise patience, perseverance, determination, and you must have faith in yourself and in your own latent potential ability. Some exceptional people walk through the door with these qualities. Many others develop these qualities while in the pursuit of learning the art of Aikido. 4. How is "Aiki" taught? "Aiki" is taught through the techniques of Aikido. The techniques are not "Aiki". Aiki is the governing principle in every technique that we teach. Aiki is a way of moving the energy in the body to meet or manipulate a physical attack in such a way as to defuse it. The principle of Aiki involves several concepts. These concepts are conditioned reflexes, coordinated breathing, timing, blending with the attack, joining yourself to the motion coming at you and then learning how to extend or propel the energy out from your body. Each technique we teach is designed to teach your body the feeling of these physical principles. So first, we learn the form of the techniques, then we come to understand the principles that are making the technique work. This process requires learning the steps and forms of 15 techniques which have hundreds of variations. The training to become a black belt involves learning the 15 basic forms and then about 150 variations of those 15 forms. There are really about 3000 variations of those 15 forms but most instructors use only about 150 variations that are practiced to get the person to the black belt level. When you become a black belt, then you are no longer learning how to do techniques. At this time, you begin working with the governing principle of Aiki and you are allowed to gradually experiment with the form and to divert from the form. Eventually at the master level, the form disappears and the body is fully trained to move naturally, using the principle of Aiki, in natural, creative and innovative ways. 5. So then Aikido is not really learning to fight? 6. What is Aikido then? Aikido is learning to stop a fight using an ancient Samurai principle called Aiki. While the Samurai used Aiki to fight and to kill, it was Morihei Ueshiba that took the concept of Aiki and sought to use it to create peace, love and harmony. This was his innovation and contribution to modern society and this is why Aikido is so different than other martial arts. We don't want to fight. We don't care about competitions or tournaments or defeating other people. Our goal is to train together as friends, to develop a community of people training in the ideals of peaceful coexistence while defending against evil and harm but doing so in such a way so as not to permanently injure or harm the other person. 7. How can Aikido change my life? More than a fighting strategy, Aikido is a way of life. The word Aikido means the "Way of Aiki". In the old style Japanese culture, the arts were considered paths to intuitive wisdom. Philosophically then , Aikido is a way of life that trains the body through the discipline of the training itself. Within the dojo environment, the study of Aikido becomes the place where the ego interacts with the discipline of the art and the individual then encounters new frontiers of their own spirituality as they struggle to conquer their own self will. Every aspect of the "self" is eventually challenged within the training and the new person emerges having been forged through constant daily training. "I want considerate people to listen to the voice of Aikido. It is not for correcting others; it is for correcting your own mind. This is Aikido. This is the mission of Aikido and should be your mission."